ADOPTED: I have found my forever home and have a wonderful life I had only dreamed of!! I even have a great brother Evan who is teaching me stuff too!! My brother Evan and my moms!! I was found roaming the busy streets of Columbus and was taken to the Franklin County Animal Shelter. 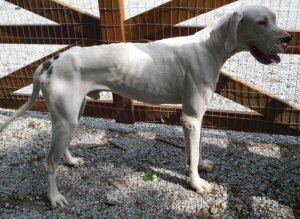 When my owners never came for me the wonderful people at the shelter contacted Harlequin Haven Great Dane Rescue to come for me. 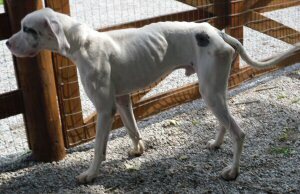 I guess my owners did not want me any more because I am deaf and could not hear them when they called me. I am now safe at the rescue and enjoying life's many simple pleasures. I have a soft bed, toys to play with, food to eat and air conditioning!!! I weigh only 113 pounds, I am at least 30 pounds underweight. I am being fed 4 times a day and I enjoy every mouth full!! I am a very happy boy and love to share snuggles and kisses!! Updated August 1: I have only been here a short time and I already weigh 124 pounds and HEY I am still gaining weight and enjoying every minute of it!!! Updated August 15: I am now ready for adoption. I am a very happy and loving Dane and am looking for a wonderful family to love me forever and ever!! !